Yukon Cabs are economical bolt together cabs with OEM styling. Cab is not ROPS certified, but sits in front of the existing, un-modified factory ROPS. Included in this cab are features such as a powered front wiper on a safety glass windshield and rear safety glass panel. This cab is available with a choice of either soft or hard doors, and a basic steel roof or a color-matched ABS formed roof (ABS roof does NOT fit BX24, BX25, BX25D or BX2670 models). The backhoe cannot be operated from inside the cab when the rear panel is in place, but the rear panel can be removed to operate the backhoe. Your cab can be custom configured below with these and other optional accessories. Cab picture shown may include optional features, available at extra cost. Cab height as measured from the platform floor, is 61" to the top of the basic black roof, 61-3/4" to the top of the studs on the basic black roof, and 63" to the top of the ABS roof, if so equipped. The studs may be removed from the basic steel roof, if the ABS roof is not being purchased. 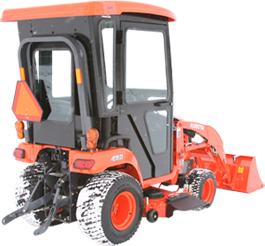 This cab will fit bare tractors or tractors with a factory loader and backhoe. The Optional ABS Roof DOES NOT FIT the BX24, BX25, BX2370 or BX2670 models without modification by customer - see note under optional roof detail.